NOTE: This macro is for X8 only. It will not function in CorelDraw 2018. Do you ever just need to create a quick outline by eye without thinking about the size. 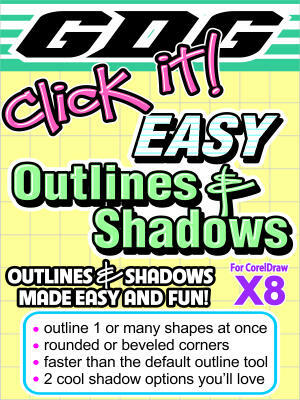 This macro can quickly create outlines and shadows with a couple mouse clicks. The mouse clicks are the distance of the contour, inner or outer! For X8 only! This macro is for version X8 of CorelDraw only!